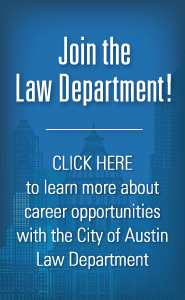 The City of Austin Law Department believes strongly in providing an opportunity for students and other interested applicants to develop the skills necessary to succeed in a professional environment. The Department's Internship Program includes opportunities to volunteer, paralegal Internships, law student Clerkships, and law graduate Fellowships. As part of the City of Austin Law Department's Internship Program, paralegal interns are enrolled full-time in an accredited school of paralegal studies and hired to develop job skills, clarify career direction, or gain specific skills while completing degree requirements. Under the general supervision of attorney, secretarial, and paralegal staff, paralegal interns perform a wide variety of paralegal activities. As part of the City of Austin Law Department's Internship Program, law students and recent law school graduates have the opportunity to gain exposure and experience in a dynamic municipal law practice through Law Department Clerkships and Fellowships. Clerks and Fellows provide legal assistance to all Law Department divisions and perform a variety of tasks, including research, writing, and attending legal proceedings. The goal of our internship program is to assist students and recent law graduates in meeting educational and professional goals. The City Council Open Government page provides information about Austin City Council, including information about open meetings and public information requests. Visitors can also easily access information about Council filings, campaign finance filings, and more. For more information, contact the Ethics & Compliance Team at 512-974-2180. This one-day event will feature open government advocates and practitioners discussing hot topics in open government and transparency. The Texas Public Information Act gives you the right to access government records, and the public information officer may not ask why you want them. All government information is presumed to be available to the public, with certain exceptions. Request public records online.